A blanket term for many abdominal disturbances for which no other cause can be found. There are no agreed causes for the condition of irritable bowel. The general medical thinking is that it is a disorder of the system that controls mobility of the bowel – the nerve layer within the walls of the bowel that makes the muscle of the bowel contract. Many sufferers appear to be under stress, if not definitely suffering depression. Since irritable bowel syndrome is what is wrong with the majority of patients seen by gastroenterologists worldwide, it is unlikely that some simple cause such as Candida has been overlooked. More likely it is a non-specific, humble part of the human condition. Most people with irritable bowel are young women. The core symptoms are recurrent abdominal pains, often with minor changes in bowel habit from constipation to diarrhoea. A consistent finding is that pain is relieved by defecation and made worse by stress. There is a feeling of abdominal distension and bloating. The motions may be pellet-like and individuals need to keep opening their bowels. The symptoms are experienced for months, if not years, despite which the individual looks well, does not lose weight and there are no abnormalities to be found on examination apart from non-specific abdominal tenderness. It is important to have some basic investigations, not only to exclude other disease, but to reassure individuals that their symptoms are being taken seriously, since no one doubts that they do experience pain. The main differential diagnosis is inflammatory bowel disease; in such cases the individual usually feels ill and loses weight. Investigations involve blood tests, which show inflammation, and sigmoidoscopy to inspect the lower bowel and perhaps take biopsies from the bowel wall. The older the individual the more extensive the testing, as the risk of cancer grows, but with average individuals in their teens or twenties the diagnosis can be made with reasonable confidence and minimal investigations. Treating the condition can be difficult. For many people simple reassurance is enough. Others might try more or less fibre in their diet. Numerous drugs, for example mebeverine, are said to relax the muscles of the bowel; some people derive benefit from such drugs, others do not. 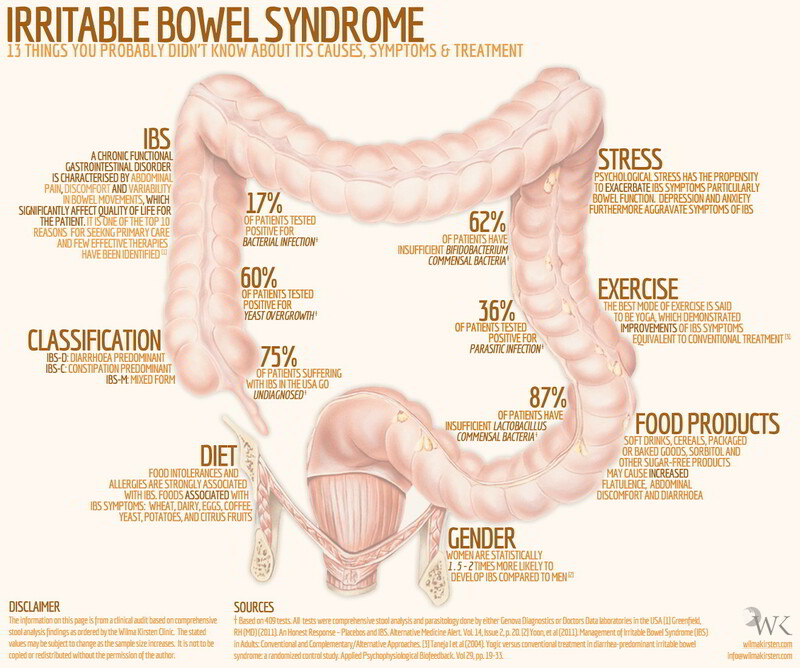 Recently, specialists have been subdividing irritable bowel into separate syndromes, which may lead to more focused treatment. If there are symptoms of depression or stress a course of antidepressants can be helpful. One of the pitfalls with the condition, of which surgeons are well aware, is to indulge in ever more extensive investigations. Their reluctance to do more should not be interpreted as being uncaring; operations carry hazards and can lead to abdominal pains themselves. With reassurance many people find the condition decreases over a few years. Diet – consult a nutritional therapist or naturopath. Auricular therapy relieves anxiety and regulates digestion, in conjunction with dietary changes following traditional Chinese principles. Chiropractic can help if the condition is accompanied by low back pain. Ayurveda offers oral preparations, panchakarma detoxification, yoga meditation and marma therapy. Other therapies to try: homeopathy; tai chi /chi kung; cymatics; hypnotherapy; acupuncture; Chinese and Western herbalism; autogenic training; chakra balancing.